Sometimes we may need to save our word document as a pdf file in that time we can use Save As PDF file option which is available in office 2007 itself instead of using any extra software or any online converter to do that task. 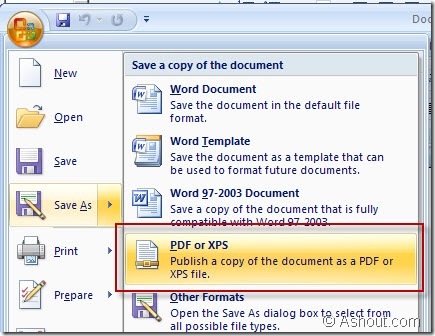 To add Save As PDF option to our Office 2007 software we need to download a small Plugin called SaveAsPDFandXPS form Microsoft site and install it on our computer. You will see Save As PDF option in it. Enjoy converting or Saving Word document as PDF file. The good one for who don’t have adobe acrobat. Creative suggestions ! I loved the details ! Does anyone know where my business would be able to grab a template 2012 KY KREC Offer To Purchase Commercial Real Estate copy to use ?